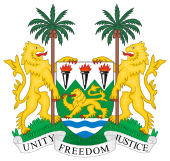 General elections were held in Sierra Leone on 26 and 27 February 1996 to elect a president and Parliament of Sierra Leone. A second round of voting in the presidential election was held on 15 March. It was the first election since multi-party politics had been reintroduced following a referendum on a new constitution in 1991, and the first multi-party election held in the country since 1977. The parliamentary elections were won by the Sierra Leone People's Party, which returned to power after a 29-year absence. The All People's Congress, which had governed from 1968 to 1992 (from 1978 to 1991 as the sole legally permitted party) finished fourth. The presidential election was won by the SLPP's candidate, Ahmed Tejan Kabbah. However, he was deposed by a coup led by Johnny Paul Koroma on 25 May 1997. On 10 March 1998 Kabbah was returned to power by Nigerian-led ECOWAS forces. As no candidate won more than 55% of the vote in the first round, a second round of voting was held. The SLPP won the most seats in the elections, but fell well short of a majority, with only 27 of the 68 elected seats. This page was last edited on 7 December 2018, at 20:51 (UTC).